Dimple Shah has it all figured out. With graduation behind her, she’s more than ready for a break from her family, from Mamma’s inexplicable obsession with her finding the “Ideal Indian Husband.” Ugh. Dimple knows they must respect her principles on some level, though. If they truly believed she needed a husband right now, they wouldn’t have paid for her to attend a summer program for aspiring web developers…right? Rishi Patel is a hopeless romantic. So when his parents tell him that his future wife will be attending the same summer program as him—wherein he’ll have to woo her—he’s totally on board. Because as silly as it sounds to most people in his life, Rishi wants to be arranged, believes in the power of tradition, stability, and being a part of something much bigger than himself. 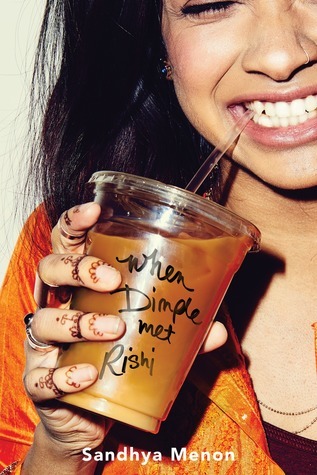 When Dimple met Rishi… things did not go well. See, Dimple and Rishi were promised to each other by their parents. Only, Dimple has no idea she was set up, while Rishi does. As you can guess, that is bound to lead to catastrophic, but also quite entertaining, events. Obviously, arranged marriages happen all the time, especially to young people of certain cultures, but I still found this story very original. That is why I read it, actually. It’s not a story that I can imagine happening to a lot of different people, because it’s not entirely plausible, but the originality is part of what makes it so interesting. At the same time, nothing is too far-fetched that you have to force yourself to believe it. In this scenario, it’s not the girl who is the hopeless romantic, it’s the boy—Rishi. Rishi is adorable. Quite frankly, I don’t know how I would have reacted if I had been in Dimple’s situation—probably I would have freaked out as well—but somehow Rishi always makes it better. He is patient and definitely, wonderfully romantic. He’s not the type of guy you have to beg to bring you flowers. He’ll do it by his own volition. Sadly, yes, there are stereotypical portrayals of characters—I’m referring mostly to the secondary ones—so don’t think that this is a flawless book. But you know what, I wanted to be entertained and I was so I’m happy. Satisfying, sweet YA contemporary romance with culturally diverse main characters and interesting competitions to spice things up at the web development summer program. Dimple and Rishi are a wonderful pair.